It was a sad occasion that brought us out to Western, PA in early November. Russ’s beloved mother Mary passed away so we, along with his three grown children, and sister Dee and her husband David, all rendevoused to Concordia at Cabot, Mary’s current residence. 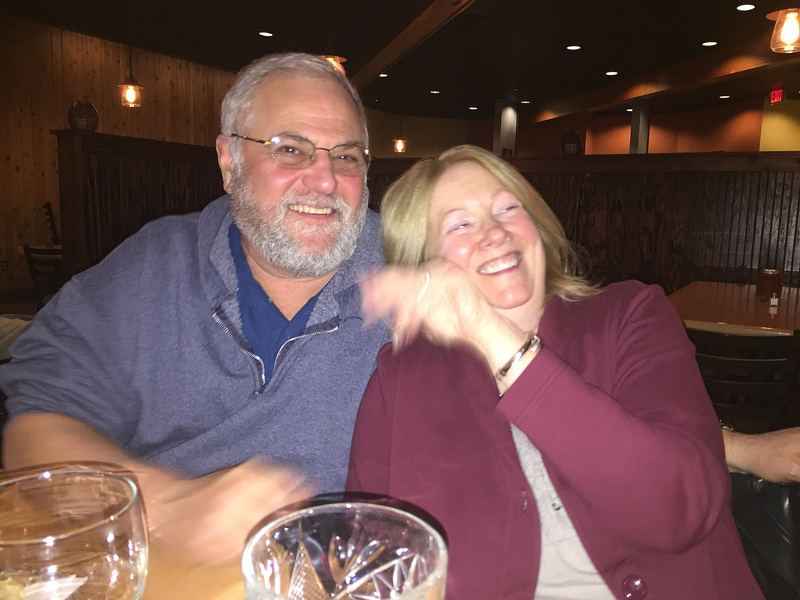 Daughter Julia, sister Dee and her husband David all flew in from California (each on separate flights), while son Daniel commuted in from Massachusetts, and joined his mom and brother David to continue the trek from Glenside… Got all that?? Russ was already out there for several days prior to my arrival, so I drove a second car across the state. And good thing because we needed two vehicles for schlepping people around—not to mention transporting an assortment of household goods back East with us. You may recall that Russ and I moved Mary from her house of 40 years into independent living last June. During that trip we visited several new—and delicious—restaurants in the area. So with those establishments in mind, we enjoyed a few good meals as a family, despite the difficult times. 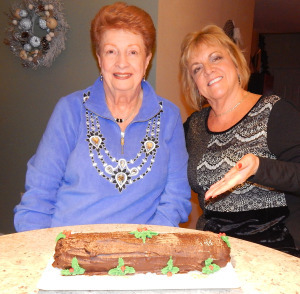 One such scrumptious meal was had at the not-so-new Saxonburg Inn— which last year we enjoyed with Mother Mary and her close friend Janet—but since I wrote about that last September under the blog title “Dining Out on the Mother’s Trip” I’ll concentrate on a few of the others. We were impressed with the cutlery presentation at each table setting. Dee’s luscious salmon filet pinwheels. A plate of surf and turf was Lynn’s entree. Jumbo lump crab cake baked with risotto for Russ. And let me tell you, Dee’s bedraggled husband David was more than ready for a glass of wine by the time he finally arrived! The next night was a Friday and we had reservations at Evolution Grille, a seasonal restaurant in Freeport that showcases progressive american cuisine, with a unique menu that blends traditional classics prepared with a contemporary flair. With a large variety of options, I knew it would appeal to everyone’s discerning palette—plus it’s BYO! Our waitress Jessica was a hoot, and certainly knew their menu backward and forward. That particular evening everyone was starving, having commuted, and/or in Russ and Dee’s case running around, all day without any lunch. So appetizers were calling our names, loud and clear! 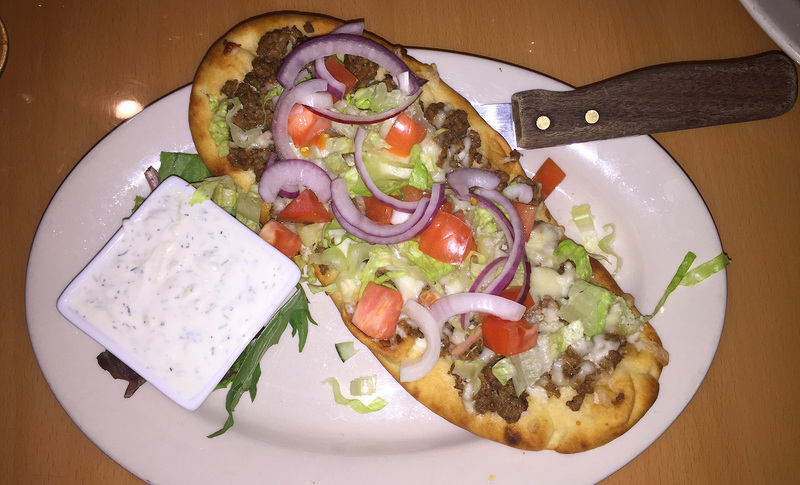 Younger son David zeroed in on the Gyro Flatbread special that was loaded with ground lamb and veggies. Son Daniel and brother-in-law David, both chose the Pierogie of the month—their signature Tailgaters, filled with pastrami and caramelized onion. Julia and I decided to share the Scallop special dressed with gorgonzola and a balsamic drizzle—to die for!! And Russ enjoyed a special that consisted of a crab cake filled grilled portobello. Not a shy one in the bunch, we all shared and therefore got to taste a bit of everything. The loaded flatbread special appetizer. A house favorite, “Tailgater” pierogies. 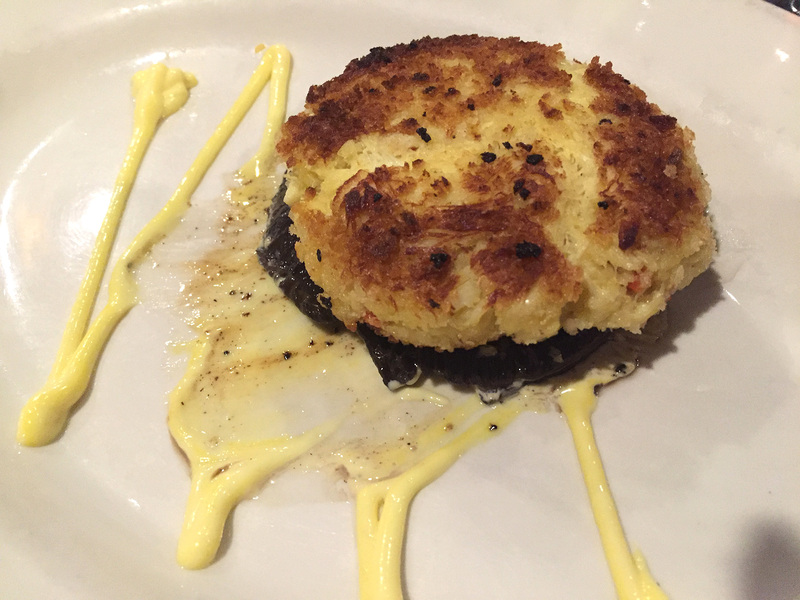 An artfully plated crab cake stuffed portobello. Now onto those entrees. The boys each ordered the Sarver Supreme Burger—6 oz burger, with peppercorn bacon, cheddar, BBQ sauce and a whopping tower of onion rings (and they both opted for chunky blue cheese instead of the cheddar.) Dee and I chose the Crab Cakes—two 5 oz jumbo lump, tabasco remoulade with root fries and vegetables; each having enough leftover for another meal. 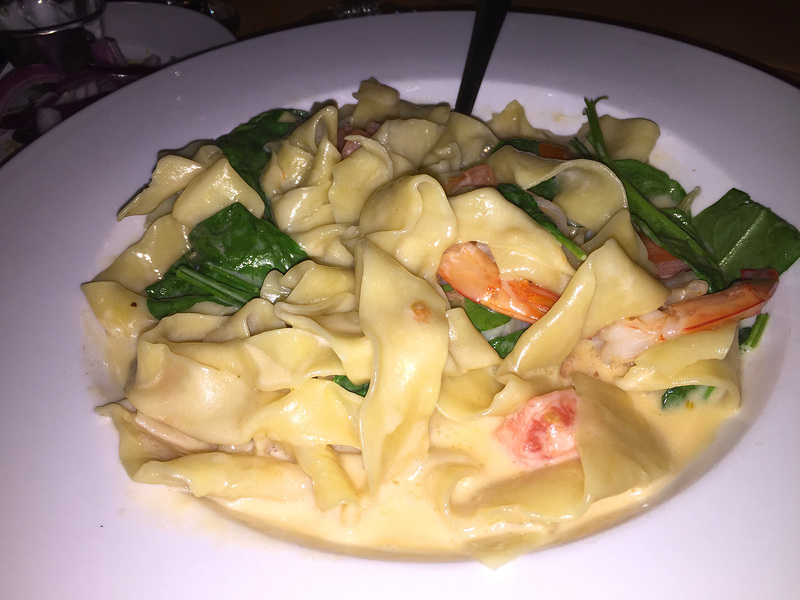 Julia truly enjoyed her Seafood Pasta—hand cut pappardelle, scallops, shrimp, tomatoes, spinach in a lobster sherry sauce. And the “men,” as men do, ordered the huge NY Strip Steak smothered in sautéed mushrooms, a special of the night. Daniel and David devoured these towering burgers and fries. Russ and big David managed to finish these behemoth steaks. This crab cake dinner with parsnip and sweet potato fries became two meals for both Dee and me. Julia loved this seafood pasta entree. 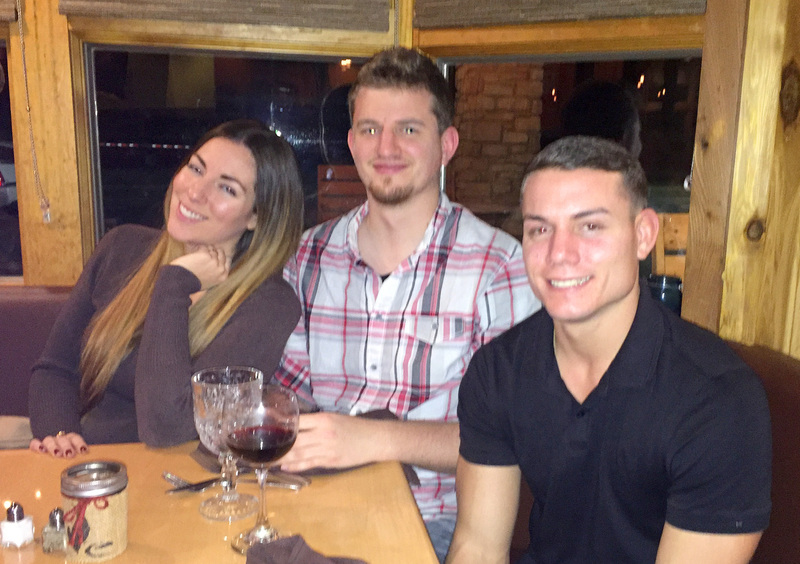 Julia, Daniel and David Hartman patiently awaiting their appetizers. Brother-in-law David Ruttan and his lovely wife Dee Hartman.